In December 2005 the Conference of the Parties (COP) of the UN Framework Convention on Climate Change launched a process of considering options to reduce emissions from deforestation and forest degradation in developing countries (REDD). The next COP will decide on key issues regarding REDD, such as policy instruments, positive incentives, general principles, technical and methodological requirements, and financing options. Emissions from land use change account for 20–25% of all anthropogenic emissions, with 90% of them originating in the tropics. In the period from 2000 to 2005, land conversion caused a total emission of 4.2 GtCO2e, and forest was lost at a rate of 11.3 million hectares per year. Deforestation is driven by a wide range of different factors, depending on the specific sites and socio-economic conditions. A differentiation can be made between direct drivers (pressure for agricultural land, over-logging, or building infrastructure) and underlying drivers, such as policy and institutional factors and economic, technological, cultural and demographic conditions. Social inequity and topographic aspects can have an influence as well. 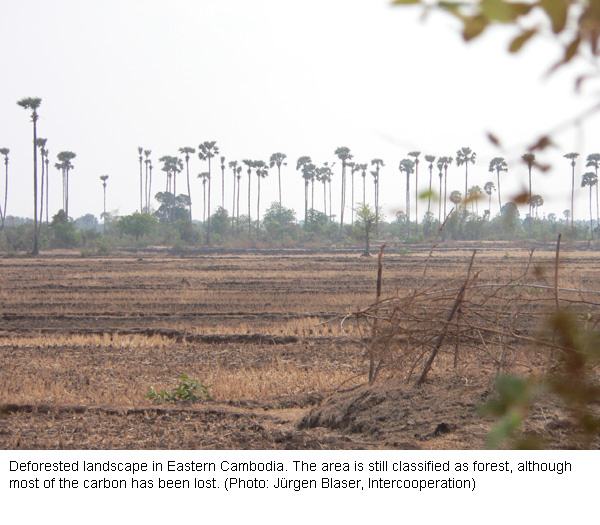 Despite the controversy over forest conversion, not all deforestation is undesirable. Social and economic pressure will inevitably lead to the conversion of substantial areas of forest to cropland and other land use types. Thus, deforestation can be an integrated element of economic and social development and, as such, is highly desirable in many circumstances. However, it is of utmost importance to ensure that deforestation be discouraged whenever it is not efficient from an economic point of view, when it threatens environmental stability, or when it leads to social inequity and conflicts. Deforestation and forest degradation (DD) differs between forest-rich and forest-poor countries. Forest-rich countries such as Brazil, Indonesia, Sudan, Myanmar or the Democratic Republic of Congo currently have the highest rate of absolute deforestation per year. The four countries combined account for 40% of the total tropical forest area and for 52% of the total deforestation rate between 1990 and 2005. In contrast, forest-poor countries such as Burundi, Togo or Nigeria have the highest relative deforestation rate. Consequently, DD in these countries have a critical impact on the livelihoods of poor people whose subsistence is highly dependent on endangered forest ecosystems, increasing their overall vulnerability. Any approach to REDD should therefore give special consideration to areas where DD should be discouraged, and consider poverty alleviation measures for forest users. The Committed Forest Approach allows for combining these priorities. It is based on the sovereign decision of each country on which forests can be committed as a long-term carbon reservoir for the future, as well as on consideration of the priorities and needs of those involved in DD. Therefore the Committed Forest Approach provides a framework for simultaneously reducing deforestation where it is not in line with development priorities, thereby enhancing the permanence of carbon storage in the biosphere, and tapping potentials to improve the livelihoods of poor forest users. The Committed Forest Approach is about to be tested in a REDD pilot project in Madagascar launched by the Swiss Agency for Development and Cooperation (SDC) in collaboration with GTZ (the German government agency for technical cooperation) and Intercooperation. Under the name of FORECA (Forêts engagées comme réservoirs de carbone, English: Committing Forests as Carbon Reservoirs) the project combines the objective of accountably reducing emissions from deforestation and forest degradation while simultaneously reducing poverty at the local level and increasing institutional capacities at both the national and the local levels. Preliminary results of the project are expected by summer 2008. The ongoing process towards REDD clearly offers an opportunity to promote sustainable forest management and poverty reduction. However, it remains unclear whether these two concerns will be adopted as main principles to guide international decision-making under the UNFCCC. Cultivation of genetically modified crops has increased markedly, especially in emerging economies. At the same time, scientists are continually developing new applications of green biotechnology. Public institutions have begun to invest in green biotechnology in pursuit of aims such as improving local crops for poor farmers. Moreover, many developing countries are currently in the process of defining policies on green biotechnology. These developments have prompted the Swiss Agency for Development and Cooperation (SDC) to formulate its own position regarding green biotechnology. According to SDC, genetically modified crops can very well contribute to sustainable rural development under certain circumstances. Projects involving green biotechnology must be assessed individually from case to case. For example, they do not make sense unless they contribute to improving food security, concentrate on small-scale farmers, guarantee free access to plant genetic resources, and ensure biosafety. The final political decision on adopting green biotechnology must always be made by the developing country concerned. SDC sees its main potential in supporting participatory national debates and decision-making processes. In addition, SDC can invest in capacity building in the areas of biosafety and sustainability assessment, as well as in public agricultural research. The results of the Millennium Ecosystem Assessment leave no room for doubt that it is time to act. 15 of the 24 ecosystem services assessed were found to be degraded or subject to unsustainable use, 5 were considered stable, and only 4 ecosystem services showed improvements. Concrete examples such as an “Action Impact Matrix” point out entry points to achieving sustainable use of ecosystems. However, implementation of the proposed agenda urgently requires above all innovations at the institutional level. The authors make several suggestions regarding the development of new institutional forms. Further value added is offered in the last part of the report, which outlines the respective responsibilities of civil society, the private sector, the research community, and governments at the national and international levels. China’s rapidly rising economic power is engulfing Africa. On the way to socialist market economy, China is anticipating horrendous requirements of raw materials and has begun to gain an important foothold in Africa. Chinese companies expanding to Africa have inevitably been followed by the Chinese banking sector. By now Chinese banks in Africa have joined the league of globally influential credit institutions and represent a prominent driving force in development. Friends of the Earth US (FoE) has taken a look at some of the pressing questions raised by this situation. In a study entitled Time to go Green, FoE examined ten Chinese banks relevant in Africa with regard to environmental financing standards, including China’s governmentowned policy banks and four of the largest Chinese commercial banks. Only two of the ten banks, the China Development Bank and the Export-Import Bank of China, have to some extent publicly disclosed their environmental financing standards. This shows that Chinese banks do not consider environmental issues a matter-of-course part of business, but rather still regard them as an act of charity. Nevertheless, according to FoE, several influential NGOs and bank regulators are working to raise the awareness of environmental concerns among China’s financial decision-makers. Source: Time to Go Green – Environmental Responsibility in the Chinese Banking Sector. Michelle Chan-Fishel. Friends of the Earth and Bank Track. May 2007. 102 p.
35% of the world’s mangrove cover has vanished; some countries have lost as much as 80%. The main reasons behind this development are conversion to aquaculture and timber extraction. Ecosystems, such as mangroves, which can no longer provide ecological services (e.g. protecting the shoreline against flooding, reducing soil erosion, and stabilising land through sedimentation) have a social and economic cost. It should also be remembered that mangroves are a rich source of traditional and timber products. The tsunami of December 2004 raised awareness of the vulnerability of coastal ecosystems and highlighted the danger of underestimating their importance. 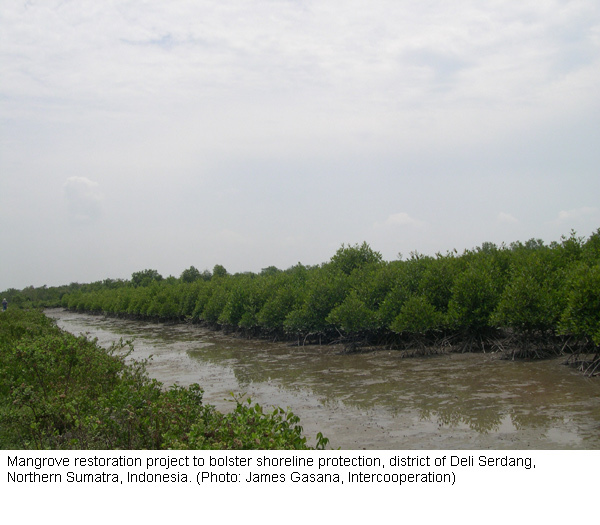 However, the restoration of mangrove forests with a full complement of biodiversity is a long and complex process. It is essential that integrated coastal management takes account of the links between the impact on the coast and watershed management, not to mention the resilience of mangroves, the mitigation of the consequences of global warming, and the cost of conserving ecosystems. Source: In the front line: Shoreline protection and other ecosystem services from mangroves and coral reefs. UNEP-WCMC. 2006. 36 p.
The dominance of the agro-industrial model has led to the loss of traditional agricultural knowledge, often because local rural communities feel their expertise is inferior to outside knowledge. Also, to contribute positively to a rural development project, the use of information technologies must become part and parcel of the community’s knowledge system values and culture. This publication is the result of a 2006 workshop on knowledge-sharing for rural community development held in Ecuador. For example, the Agrarian Information System (AIS) in the Huaral Valley of Peru systematically collects and shares important information with some 6,000 farmers in the region. It is built around a diagnostic tool which identifies information of particular relevance to the farming community (e.g. what to plant, at what price to sell products, which financial institutions they should contact, the number of hectares being cultivated in the area, when to plant and when to harvest). Members of the community were taught how to use both the Internet and software provided free of charge, while telecentres ensure the sustainability of this infrastructure. To guarantee the widespread integration of the AIS in the region, plans are afoot to disseminate this information via radio broadcasts and news bulletins. Source: Compartir conocimientos para el desarrollo rural: retos, experiencias y métodos. Sally Burch. Agencia Latinoamericana de Información. January 2007. 139 p.
Experiences from field activities often contain valuable information. Yet they are frequently poorly documented and hardly analysed, thus remaining available only to few individuals. Based on its own experiences and on the results of a pilot project in Peru, the Centre for Information on Low External Input and Sustainable Agriculture (ILEIA) has developed a simple method for optimal documentation of field experiences. A publication entitled Learning from experience introduces this method in a concise and well-structured manner. Focusing on implementation, the manual explains the most important preconditions and each individual step of implementation. Users are left enough freedom to adapt the method to specific situations. The method pursues ambitious goals: it is intended to encourage self-reflection and learning processes within the group applying it, to improve institutional competence, and to provide a valuable source of information for external users. However, the availability of sufficient resources to ensure proper implementation from the very beginning is an important precondition. This in turn requires a strong commitment by decision-makers. Most small-scale farmers in sub-Saharan Africa cannot afford commercially produced seed potatoes. Usually they save seed potatoes from their own crop. However, potato plants can be infected with various bacteria, viruses and fungi that are not always easy to recognise and often reach the tubers undetected. This has a negative impact on yields, as good yields depend on high-quality seed. 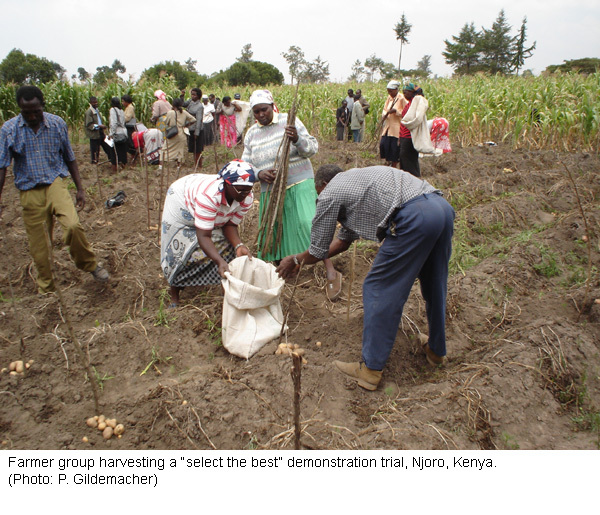 A manual for trainers shows how farmers can learn to detect diseases and choose the best plants for producing seed potatoes (positive selection). The training course addresses farmer groups and consists mainly of practical exercises in the field. Essentially based on a nine-month field experiment where previous practices of the farmers are compared with the technology of positive selection, the course takes up a very moderate amount of the farmers’ time while producing clearly visible results. Experience has shown that the use of positive selection increases yields by an average of 30 percent after only one season. The course is clearly tailored to the needs of poor small-scale farmers and can be applied in different contexts. Source: Select the Best: Positive selection to improve farm saved seed potatoes: Trainers manual. Peter Gildemacher, Paul Demo, Peter Kinyae, Mercy Wakahiu, Moses Nyongesa, Thomas Zschocke. International Potato Center (CIP). 2007. 126 p.
A UNCTAD study pointed out in 2004 that trade liberalisation can only make a minimal contribution to slowing the growth of extreme poverty in the least developed countries (LDC). The study estimated that without liberalisation, 471 million people would be living in extreme poverty by 2015, while liberalisation would reduce this number to 463 million people. In this context, K. Savagado turns to an aspect that has received little attention in the debate on liberalisation. He points out that in a liberalised market, poor farmers are hardly left any possibility to invest in soil conservation measures. This will inevitably lead to soil degradation, which in turn will aggravate the situation of the coming generations, thus causing injustice between generations, or, in his words, “an intergenerational tragedy of the commons“. This situation necessitates measures at the policy level, such as the promotion of interregional trade or the abolishment of taxes on agricultural exports. Moreover, LDCs should focus more closely on niche products. After investments in agriculture by governments and development organisations have dropped markedly in recent years, the author expects rural development to become a re-emerging responsibility. Source: Poverty, Land Conservation and Intergenerational Equity. K. Savagado. 2007. 67 – 86 pp. In: Agricultural Trade Liberalization and the Least Developed Countries. Niek Koning and Per Pinstrup-Andersen (eds). Wageningen UR Frontis Series Vol 19. 2007. Farmers in the Punjab, Pakistan, have succeeded in saving water by using resource conservation technologies such as zero tillage or levelling of fields with the aid of laser. At the same time these technologies have allowed them to increase yields and reduce production costs in their irrigated rice-wheat and sugarcane-wheat systems. However, these savings have also encouraged medium and large-scale farmers to expand their irrigated cropland, leading to an increase in the use of water from irrigation channels and a simultaneous drop of the groundwater level. The authors of this publication put into perspective the opinion that improved irrigation efficiency can actually have a positive influence on the total amount of water used in a watershed. They also point out the importance of an integrated watershed approach to water conservation. While water-saving technologies do increase crop yields per unit of water, it is important to establish institutional regulations that include the use of groundwater along with surface irrigation water. The key statement is that improved irrigation efficiency does not automatically lead to sustainable water savings. Source: Water Saving Technologies: Myths and Realities Revealed in Pakistan’s Rice-Wheat Systems. Mobin-ud-Din Ahamd, Hugh Turral, Ilyas Masih, Mark Giordano and Zubair Masood. Research Report 108. International Water Management Institute. 2007. 25 p.
A “Livestock Week” has offered an opportunity for experts to discuss the role of livestock production in both poverty reduction and climate change. The event included a meeting of the Inter-Agency Donor Group (IADG), a loose group of livestock experts, as well as the presentation and discussion of a book entitled Livestock’s long shadow. The book demonstrates how livestock production contributes to global warming, for example through methane emission by ruminants or conversion of forests into grazing land. In view of the increasing global demand for animal products, the authors favour the intensification of livestock production. 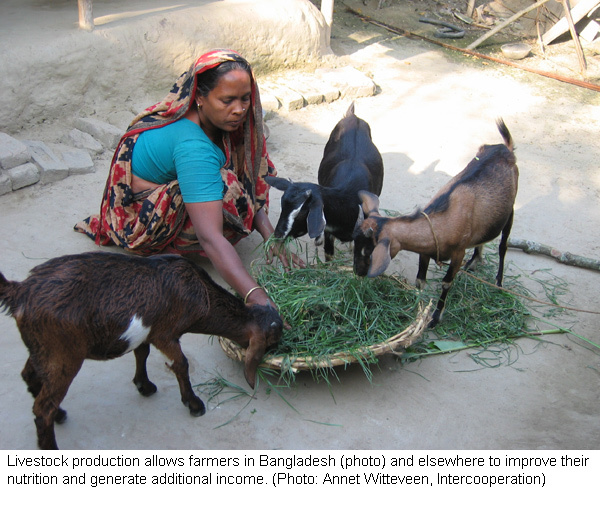 By contrast, the IADG emphasised the positive role of livestock production as a means to reduce poverty. For example, direct consumption of animal products by livestock producer families has a positive influence on nutrition and health. On the other hand, poor farmers in particular will be increasingly affected by climate change in the future. When looking for new approaches, poverty reduction and climate protection should not be played off against each other at the cost of the poor. The IADG considers it important to seek solutions to reducing emissions and alternative income opportunities outside livestock production, in addition to climate change adaptation strategies. > Livestock’s long shadow: Environmental issues and options. H. Steinfeld, P. Gerber, T. Wassenaar, V. Castel, M. Rosales, C. de Haan. LEAD / FAO. 2006. 408 p.